Munch sent me this picture, mentioned on the "Hertford memories"
from Munch's email. Hey... spooky! Select a book at random from the pile I've inherited from my godmother, open it and it's a picture of a London CH dormitory! Is it a woodcut? Or an etching? Not sure! Anyway, some Forumites might like to see it, or may be able to date it? The book is "The Victorian Scene: 1837-1901" by Nicholas Bentley, 1968. Interesting. 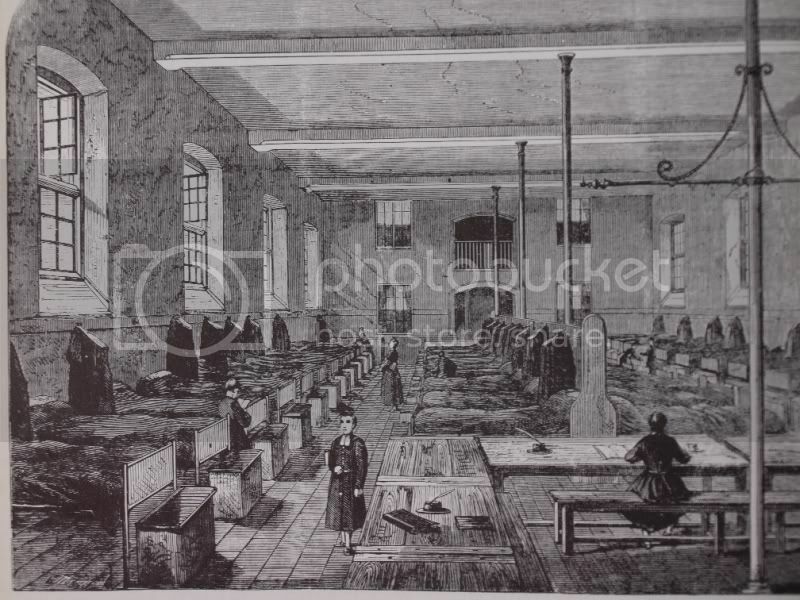 Shows a ward with, presumably 50 beds and settles. The boys do not have full length coats, and their bands are awry. La Touche (1868) shows bands neatly overlying one another. The ward looks like one of 1823, rather than the later one of 1901 (E H Pearce's book on CH, 1901). There are no signs of hats, but this probably does not mean much. In Clifford Jones book, "ChristÂ´s Hospital Heritage - Postcards", which was on sale on OBD, he has a postcard of the London infirmary. The cast iron beds are the same as we had in Horsham, but the boys are lying on the beds reading, in full Housey, but covered by a blanket, so it is impossible to see the length of the coats. At least their bands are straight.